Happy April! The Orlando real estate market is approaching full swing. Lots of buyers and sellers are active in the market place now. I will first provide you the latest market update. Then, I will continue Part II on the topic of valuation from last month, and describe how to properly price a home. To start, here is a quick Orlando market summary. After the market peak in 2006 and subsequent decline in 2007, 2008, and 2009, the market found bottom in 2010, and spent 2011, 2012, and first half of 2013 in recovery mode. The chart below shows the housing inventory level (supply) during that time. As the supply dips and demand surged, the prices went up. You can see the consistent inventory decline in 2011 and 2012. But starting in may/June of 213, due to the price maturation, the market shifted again. The demand dropped and the inventory began to build. 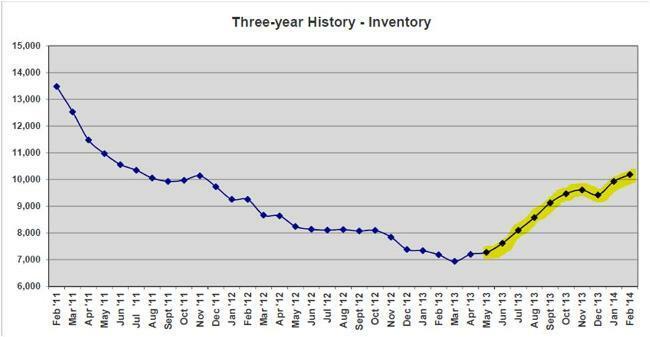 As you can see in the graph below, the housing inventory has been building in the last 10 months. This means the number of houses for sale currently exceeds demand. We are not seeing price decline at this point. What we are seeing is price stabilization. Homes are not selling at incrementally higher and higher prices, but have bounced off the ceiling and staying within a narrow range. There are generally 3 approaches to value theory in real estate: (1) comparable sales (2) reproduction cost (3) income potential. In residential resale, comparable sales approach is the method of choice. It uses closed sales to determine the market value of a property. Assuming the market is efficient and the buyers and sellers act in their own best interest, we can derive value based on how sellers are selling and buyers are buying. Like stock prices, the supply and demand ultimately drive the fluctuation in price: when demand exceeds supply, the price goes up. When supply exceeds demand, the price goes down. A property does not have a fixed value. Its value changes with time. Unlike shares of a company’s stock, no two pieces of real estate are exactly alike. Comparable sales approach takes the available sales that meet the right criteria (sufficiently similar to the subject property, sufficiently close to the subject property, and sale date close enough to reflect the current market) and compares them to the subject property. Adjustments are then made based on established guidelines as well as subjective judgments to increase or decrease the value. For example, if a home that backs up to a road sold at a particular price, an otherwise identical home across the street that backs up to a wooded conservation would be presumed to be able to fetch a higher price (the value adjustment for conservation frontage). A common feature in Florida homes is the swimming pool. We presume a home with a pool sells for a higher price than an identical home without the pool. Two crucial factors in doing the comparable sales method correctly are: (1) Selection of appropriate comparable. If wrong comparables are used, however diligent the subsequent adjustments may be, the results will likely be off. For example, Stoneybrook sales should be used for comparables to a Stoneybrook subject property, not Eastwood or Avalon Park. (2) Use right adjustment values. Even when the right comparables are selected, if the adjustment values are improper, the result will be off. For example, once comparables similar in size are selected, the adjustment for difference in square footage is not what general public may expect, it may only be $30-$60 per square foot based on price range of home. Licensed appraisers are trained to do this based on their professional guidelines. These guidelines are adhered to in order for the appraisal report to be valid and accepted by the bank which uses this report to assess its risk in making the loan on the property. Real estate agents are not licensed appraisers. Their approach should start in the same objective manner as an appraiser, but there are many additional factors to consider. Many features in a home have different values to a buyer than to an appraiser. For example, top-of-the-line appliances in a kitchen will certainly impress a potential buyer, who may be inclined to pay more for this home than a similar one without them, but an appraiser will not appraise the home higher because of the better appliances. Appliances age and break, and they can be easily removed. They are personal properties that happened to be in the real property. So, a skilled listing agent considers all the tangible factors such as features and amenities, as well as intangible factors such as appeal. He/she estimates what a normal buyer would be willing to pay based on the current market environment. An understanding of market trend is paramount. In an up-trending market, the last home that sold in the area is the base on price. In a down-trending market, the last home that sold is the ceiling on price. In a stable market, the last home that sold is a mirror on price. I have to stop here. I hope the above description is helpful to you. For more details or an evaluation of your home, you can always call or email me.